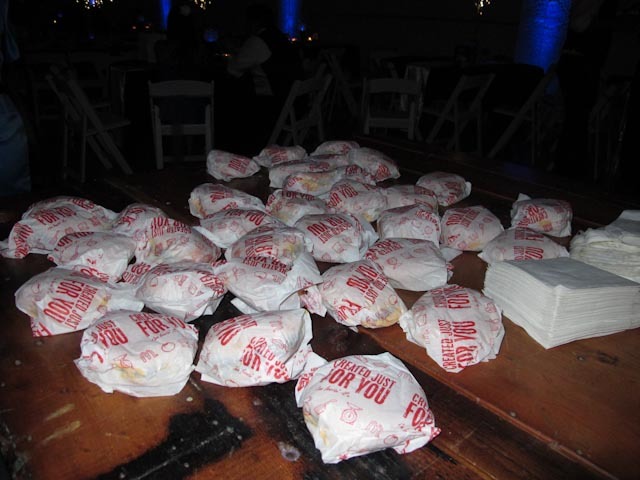 Weddings days are long and exhausting for both you and your guests, so at the end of the night a special surprise or late night snack will give your guests a nice boost of energy, but what should you serve? How about ordering 100 cheese burgers from your favorite fast food restaurant? Other tasty late night treats we have had at the Vox Theatre - Ice cream truck, Chicago Style Hot Dog Bar or pizza. Another great idea - Deco Street Eats offers late night sandwiches from their food truck. All of these snacks will please your guest and tame those late night cravings.